Nivo Lightbox is a responsive, retina-ready and simple to setup for mobile too. The Nivo Lightbox automatically detects the type of content you are trying to show and loads it correctly. No extra setup required. So no matter if you are trying to show images, image galleries, AJAX, Flash, Youtube or Vimeo videos, another website or just inline HTML, Nivo Lightbox has you covered. 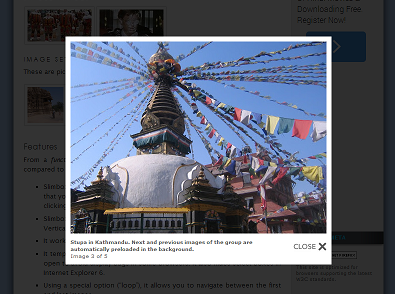 This plugin will helps us to show images nicely with overlay effect. 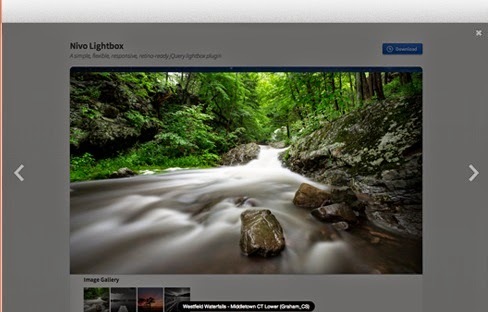 jQuery lightBox plugin is simple, elegant, unobtrusive, no need extra markup and is used to overlay images on the current page through the power and flexibility of jQuery's selector. jQuery Image and Video LightBox Plugin- Awesome HTML5 and jQuery lightbox effect, supports images, Flash SWF files, YouTube, Vimeo and local mp4, m4v, flv, ogg, ogv and webm videos, works on Windows, Linux, Mac, iPhone, iPad, Android, Windows Phone and all modern web browsers.